International airport operators and investors are likely to be regular visitors to India in the first quarter of 2015 with up to six tenders to prepare bids for. The airport investment opportunities include two greenfield airport projects at Navi Mumbai and Goa Mopa and PPP concessions for four existing airports – Chennai, Kolkata, Ahmedabad and Jaipur – currently operated by the state-owned Airports Authority of India. The CAPA India Aviation Summit, to be held in Mumbai on 3/4-Feb-2015 is ideally timed to discuss the significant opportunities in the airport sector in India, including airport retail, duty fee and ground handling - as well as all the key airline issues. India’s airports handled 169 million passengers in the 12 months ended 31-March-2014, having grown at a CAGR of 13.2% per annum over the last decade. Traffic in the first 8 months of FY2015 was up 10.8% year-on-year. Passenger numbers are expected to triple over the next decade which will require massive investment in airport expansion and construction. The Government of India, recognising that it had neither the capital nor the expertise to embark upon an airport modernisation programme on this scale, has adopted the Public-Private Partnership model for several key airport projects. Today, there are five PPP airports accounting for approximately 54% of total passenger traffic in the country. Brownfield airport, transferred to PPP operator in 2006. Greenfield airport, opened in 2008. Greenfield airport, opened in 1999. 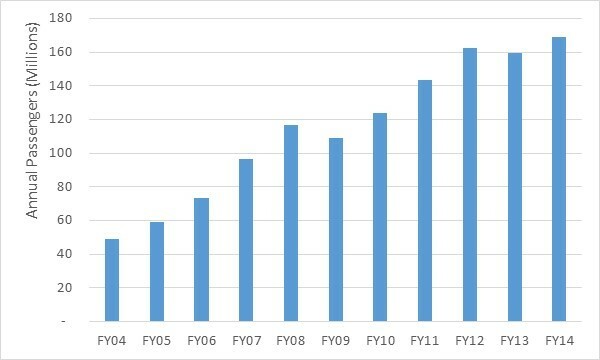 At the four metro PPP airports – Delhi, Mumbai, Bangalore and Hyderabad – the public sector retains a 26% share through the Airports Authority of India or the relevant state government. All four airports also have at least one foreign airport shareholder. The fifth PPP airport at Cochin was in fact the first private airport to be developed in India and is one of its most profitable. It is also unique amongst Indian airports in having a large proportion of its equity held by individual retail investors, primarily non-resident Keralites. Another key feature of Cochin Airport is that international traffic accounts for just over 60% of total passengers. The PPP model has delivered significant benefits. Several major new runway and terminal projects have been completed which have resulted in an increase in capacity and dramatically improved the quality of the passenger experience. But cost overruns and continued uncertainty about the economic regulatory framework have created challenges for the airport operators, while steep increases in aeronautical fees and charges have not been welcomed by airlines and passengers. Nevertheless, there is no doubt that airport infrastructure in India has been transformed by the PPP model and as a result the government appears committed to proceeding on this basis for major new projects. On 31-Dec-2014 the Indian government set out its intent for the new year by announcing that concessions for four airports, currently operated by the state-owned Airports Authority of India (AAI), would be offered on a PPP basis. This includes the AAI’s two metro airports at Chennai and Kolkata, by far its most profitable. Bidders are required to submit expressions of interest by 24-Mar-2015. These four airports join two other current tenders, both for greenfield airports at Navi Mumbai and Goa Mopa. Navi Mumbai will be the second airport serving the Mumbai Metropolitan Region and is urgently required due to the fact that the current airport will saturate before the end of the decade based on projected growth rates. Upon its completion, Mumbai will be the first city in India to have more than one airport. The project has been delayed by several years due to environmental and land acquisition challenges, however these have reportedly now been addressed. Expressions of interest are due by 28-Jan-2015. Goa Mopa airport is planned as the second airport serving the tourist destination of Goa. The current airport faces operating and growth restrictions as the facility is shared with the Indian Navy. The new airport has faced objections from tourism operators in the south of the state who feel that Mopa’s location in the north will benefit hotels in that region. Shortlisted bidders were due to be announced on 12-Jan-2015 (however the process has been delayed). The state-owned AAI operates 125 airports across the country although around 50 of these do not have any scheduled services, and only a handful are actually profitable. In recent years the AAI has successfully completed modernisation programmes at Chennai, Kolkata and 35 non-metro airports. However, as noted, the AAI’s two most profitable airports are being privatised, although the AAI will continue to receive a revenue share from the successful bidders. In the draft Civil Aviation Policy which the Ministry recently published it states that the AAI will be corporatised and may subsequently be listed. The programme for the CAPA India Aviation Summit will include a strong focus on issues related to airports, duty free and retail and ground handling, with three panels addressing these topics. India currently has five PPP airports which have transformed the quality and efficiency of infrastructure in the country in a relatively short space of time. With a strong foundation now established what are the key priorities going forward? What has been the experience of the PPP airport operators in India? Does the economic regulatory framework provide sufficient incentives for investors whilst protecting the interests of airlines and passengers? What are the next steps for the AAI in terms of privatisation, award of management contracts, construction of low cost airports, corporatisation of air navigation? How can airport projects in India become more cost effective? What are the implications of the new ground handling policy on terminal and airside operations? Will PPP airports have to offer additional handling concessions? Panel 2: Do international airport operators and retailers have an appetite for investment opportunities in India? Foreign airport operators are already partners in Delhi, Mumbai, Bangalore and Hyderabad Airports, while major global retail concessionaires are present at several airports. Multiple new greenfield and PPP opportunities are coming up this year. What has been the experience of foreign airport operators and retailers at the current metro PPP airports? How much interest can we expect to see from experienced global parties in the PPP tenders for Navi Mumbai, Goa Mopa, Chennai, Kolkata, Ahmedabad and Jaipur? Have we only just scratched the surface of the retail and non-aero opportunity? What are the key concerns about investing in the market? What is India's risk profile relative to other emerging markets? With sustained double-digit growth in international passengers over the last decade, India represents an important long-term traffic and network development opportunities for airports and tourism authorities around the world. And India itself has massive potential to grow its inbound tourism flows. Which are the key growth markets, which ones can be develop further? Will traffic increasingly be carried by sixth freedom rather than point-to-point carriers? Which overseas airports are likely to benefit from India's growth? Are bilateral restrictions limiting growth? Will India's electronic visa initiative transform inbound tourism? An audience of around 200 critical decision-makers from one of the leading growth markets in global aviation, including C-level participation by virtually every airline and airport operator in India, means this is an event where business will be done.